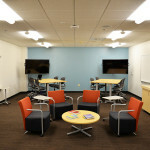 The Continuing, Online & Professional Education (COPE) classroom and office at Seattle University is a learning facility that incorporates collaborative classroom furniture with advanced A/V technology. 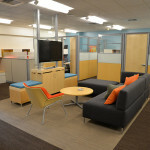 The classroom is a 670 SF room that was designed to work for small and large groups and inspire collaboration, with technology that allows participants to share with their personal devices. This space invokes a traditional classroom as well as a modern technical teaching space, so visitors recognize familiar and comfortable aspects. 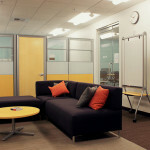 The office is an 870 SF room for five instructors and staff. The team wanted individual spaces to develop class curriculum as well as a comfortable, shared meeting space to welcome new students. The shared meeting space is connected to the classroom through glass wall panels and doors, allowing the two rooms to be linked together for a more inclusive and casual teaching style. COPE’s mission is to broaden access to Seattle University’s transformative education, and the classroom and office were designed to support the development of continuing education initiatives, online and hybrid graduate programs, and select online undergraduate courses.